In almost 2 decades of private practice, I’ve seen “the good, the bad and the ugly” when it comes to marital advice and relationship counseling. My clients have told me about every piece of advice they’ve read in magazines, books and courses, or received from so-called “relationship gurus.” Some of the advice has been fairly helpful, but the majority of it is ill-conceived, and makes sense only on paper — but doesn’t work in real life. That’s why I often warn my clients that when they take relationship advice from unreliable sources, they’re putting their marriage at risk because the advice might not only be ineffective, but may also be detrimental to their relationship. By contrast, I present only those strategies and insights that have produced the most amazing results. 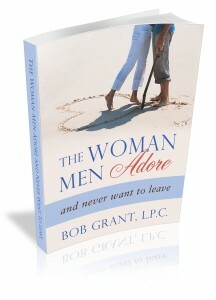 There simply is no program or resource available today that contains better strategies for dramatically improving your relationships with men than The Women Men Adore and Never Want to Leave. I’m so convinced of this that I’m willing to let you preview the e-book at absolutely no risk to you. In fact I’m so convinced of this that I’m willing to let you preview the e-book at absolutely no risk to you. To back this up, please know that I, Bob Grant, am certified by the Better Business Bureau of America. Preview this program for 60 days, and try your hand at the strategies I reveal in it — so that you can experience the amazing results for yourself. If you can find a more results-producing program elsewhere for getting your man back, your entire purchase price will be refunded. Or, if you’re less than 100% satisfied, just send me an e-mail within 60 days of your purchase, and your refund will be issued immediately.